Insight on gift giving, entertaining, and creativity. Happy Spring from Opal & Ruby! We had the opportunity to attend the NY NOW International Gift Show in NYC recently, which is an incredible and overwhelming experience! Like most trade shows and markets, the NY NOW show houses aisles and aisles of boutique worthy products and vendors. New and traditional gift ideas are showcased and put on display. 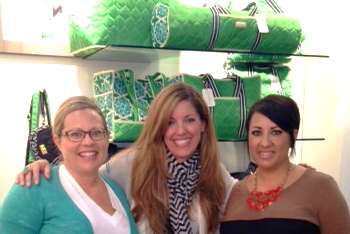 One of the highlights of the show for us was meeting Cinda Boomershine of cinda b, the casual chic handbag company. The cinda b offices and factory are located in Fort Wayne, IN, and of course, as Fort Wayne residents, meeting the Atlanta-based designer behind the brand was exciting!